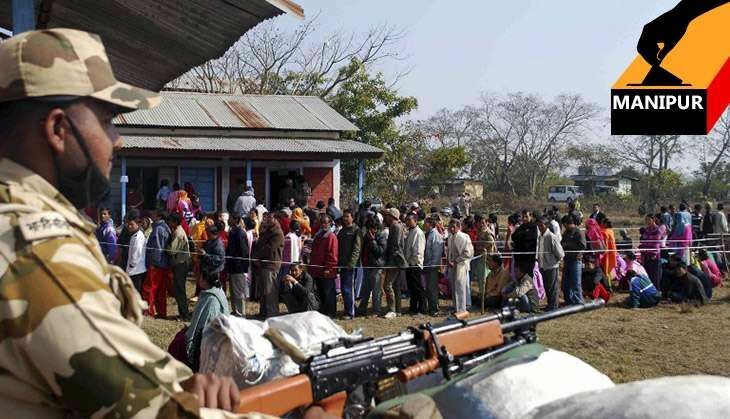 The process of filing nominations for the first phase of polls in Manipur began on Tuesday. And yet, political parties haven't yet launched a high-profile campaign in the Northeastern state. Assembly polls in the state are to be held in two phases - on 4 and 8 March - wherein close to 18 lakh people will get the chance to exercise their franchise. The first phase will see 38 constituencies going to the polls, while the second phase would see 22 constituencies up for grabs. The 100 day-long economic blockade imposed by the United Naga Council (UNC), which has put life out of gear in the state, seems to be favouring three-time Congress Chief Minister Okram Ibobi Singh, who is seeking his fourth term. The CM had, on Monday, confirmed that the three month-long blockade would end on Tuesday following a tripartite discussion in New Delhi between the state government, the UNC and the Central government on 3 February. During the discussion, it was agreed that UNC president Gaidon Kamei and publicity secretary S Stephen would be released unconditionally, to pave the way for a rollback of the blockade. However, the UNC, on Tuesday, resolved to continue with the economic blockade on NH-37 and NH-2, after a meeting held at Senapati district headquarters. The announcement came after Imphal East's Chief Judicial Magistrate remanded the two UNC leaders for two more weeks in police custody, despite the assurances of unconditional release. Earlier, the CM had told the media that if the blockade was lifted, the two office- bearers would be released unconditionally. The UNC had earlier made three demands before the talks with state and Central government, which included the rollback of the seven newly-created hill districts, the unconditional release of its office bearers and further discussions to be held in UNC's stronghold Senapati. However, the state government did not heed any of the demands, leading to a breakdown of talks. Reports suggest that the economic blockade is likely to intensify after these developments. Political parties in the state were hoping that the lifting of the blockade would bring normalcy back to state, and they could finally start campaigning in earnest. The UNC imposed the blockade on 1 November 2016, after the state government created seven new districts in the Naga-dominated areas of the state, with the stated aim of making administration easier. The people of Manipur are deeply divided between the people of hills, inhabited by tribes, particularly Nagas, and those who reside in the plains, the dominant Meities. Last year, the divide intensified after the Chief Minister Ibobi announced the creation of seven new districts, splitting up Naga-dominated districts, leading to a massive uproar amongst the community, which saw it as an attempt to compromise the territorial integrity of Naga-inhabited lands. Political observers called it a masterstroke by the Ibobi government, who also was able to appease the Kuki tribe with the creation of Sadar Hills district. As a result, only the Nagas seemed unhappy with the decision, while all the other communities began to side with the Congress government, despite the anti-incumbency at play. Remarkably, Ibobi has held on to the post of CM for three consecutive terms since 2002, and intends to rule for yet another term. With this move, Ibobi also put the Bharatiya Janata Party (BJP) in a Catch-22 situation, since it could no longer oppose the creation of the new districts as it would antagonise the dominant Hindu Meities that constitute nearly 60% of the state's population. Moreover, the Congress was also successful in portraying BJP as a party sympathising with the Nagas, considering the peace talks the Central government is holding with the National Socialist Council of Nagaland (Isak-Muivah). The BJP suffered a major setback after a popular leader Khumukcham Joykishan quit and joined the Congress. He had earlier defected to the BJP from the Congress. Joykishan's departure has hurt BJP's prospects since he was considered to be one of its Chief Ministerial candidates. Experts see his departure as a sign of which way the wind is blowing, and how Joykishan knew that he would be better off with the Congress than the saffron party. Amid all this, the Congress government is holding talks about declaring the UNC as an unlawful organisation, which has again been welcomed by the Meities. In such a scenario, the BJP has lost the edge which it had before Ibobi declared the creation of seven new districts. The saffron party is now left with only two issues to corner the state government - corruption and bad governance - which are unlikely to hurt the Congress's plans of seeking a fourth successive term in the state.